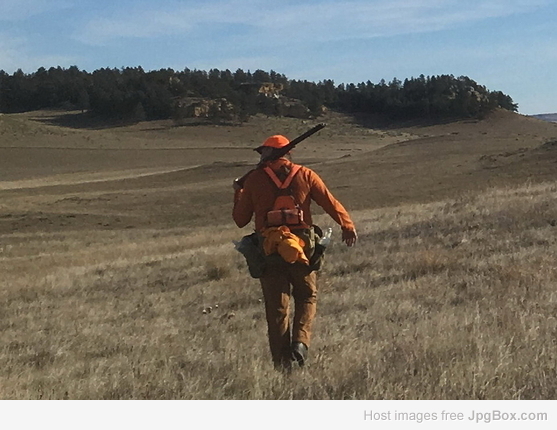 Curious about what vests everybody is using for their bird hunting? Do you have different ones for certain types of hunting or one that works for everything? Just like all other "which one" topic, this one isn't a one size fits all, in my opinion. Speaking for myself, as I hunt huge expanses of prairie, coulees, mountainside and tops, canyons, etc. of Montana - I need a vest that can carry a lot of weight comfortably supported on my hips - not shoulders. Along with dog gear, shells, food, etc. - some hunts I carry up to 104 oz. of water, a .41 revolver, and bear spray. Iv'e tried my share of vests and have found the best so far to be a Wingworks - hands down, unequivocally. Very well made, a real nice guy runs the company, and very comfortable. I'm sure if I still hunted Ruff Grouse in da Arrowhead Country of Nordern Minnesoda - I would not need such a substantial vest that costs around $250.00. Agree with mtbirder. I've been through them all, but like the Wingworks best. I ordered mine with the grouse pockets knowing that I would limit my carrying capacity, but still feel like I can carry more than ever before. It is as close to perfection as you can get. Probably depends on the type of hunting you do. I use the Orvis Waxed Cotton strap vest, because it is all mesh in the back and lightweight. It’s not too expensive and you can cinch it up at the waist to carry the weight there if you wish. It has dividers in the game bag that allow for two 32 oz Nalgene bottles and it would accommodate taller Nalgenes'. It also has a nice set up where you have stacked pockets on each side. So, you can separate things in four pockets in front. The game pouch is large and can easily hold four roosters, or more grouse and woodcock than you will ever shoot in a day unless you ignore the game laws. It has a zip pocket in back to hold a vest, rain jacket or both. The Wingworks vest would probably work better in the mountains, or if you were going to be out for 4+ hours on a hunt. The design is better for carrying the weight at your waist. It is also twice the cost of the Orvis vest and I have to think quite a bit heavier. It is almost like a back pack, but seems to be well thought out. WingWorks. Made in the USA. Very well made, very well thought out. Tougher than tough. Mine is close to 10 years old and you would never know it. I've got both the Orvis and the Wing Works. I use the Orvis on days when I'm spot-hopping with the truck, and the Orvis for big tracts. Both excellent. I have the Bird n lite vest. Started with the strap version, but didn't like the thickness of the straps and how it affected my my gun mount so sent it back for the regular vest. Great for shifting the weight off your shoulders, but hot early season. Another vote for the Wingworks. Bombproof build, weight distributed nicely on hips, lots of water storage for the dogs. I recently switched to the long pockets (vs grouse pockets) so that I can holster a sidearm and am loving it even more than my previous vest. I hate vests in general. However, the ones with a waist strap do help eliminate the tugging at the shoulder issue. Several years ago I bought a Primos Small Game Bag. The bag itself was good, the belt/ strap was a joke, but I knew that from the start. I stitched that bag to an honest to goodness padded support belt with zippered side pockets (salvaged from a high end backpack at the local NOLS store) and have loved it ever since. Eventually the blood proof liner failed and I stitched up a new one from old wader material and sealed the seams with Aquaseal. I added a small camera pouch to the lid and a sleeve that holds my fly rod tube should I desire to do the cast and blast thing. The bag holds a limit of most game birds and I don't get a sweaty back. The only shortcoming is when I go someplace that has pheasants, sharptails, and huns together. It's a bit small to hold all of that should I be so lucky. I may buy a wading vest, the short type designed for due hunters, to go with it. I once had a shorter vest and the birds in the back rested perfectly on top of the waist bag, sort of serving as a two piece version of the Wing Works unit. Pheasants Forever Bird n lite strap vest. It seems like more and more here we hunt in warm weather, and it is sure nice to take the weight off the shoulders. It has also been nice for my ever expanding midsection. It is adjustable, and in a moment of wisdom, I bought the size larger than I thought. My only complaint is the straps have interfered with my gun mount, but that has been rare and gives me a good excuse if I miss. I have an older LL Bean strap vest that I like but outgrew. It didn’t keep the weight off the shoulders as well as the BNL. I own several, but my favorite is an LLBean strap vest that they discontinued. I like my Cabela's strap vest, but they could never answer my inquiry as to WHY the majority of the blaze orange was on the INSIDE back panel; well away from any visibility? My classic Filson waxed cotton strap vest was a personal favorite until I discovered the metal hardware can scratch gun stocks...Why not use a high grade plastic for the buckle and straps ??? I do prefer strap vests, but I don't understand the rather minimal use of blaze orange on most of them. My state requires 400 sq. inches above the waist; which means a cheap blaze orange safety vest under the strap vest to make it legal. I have more 16ga. shotguns than I need, but fewer than I want...At present: DeHaan S2, Remington M31L, Browning BPS, Remington Wingmaster 870. I’m pretty sure that the Jones family invented the bird hunting vest. Filson strap w/o any fabric treatment for me.....plus, some old basic vest harkening to the 50s for pheasant. No blaze, no mesh is my only requirement.....a zippered pocket is nice tho. IF blaze is required, I prefer a blaze shirt. I much, much prefer suspenders to belts when hunting, so a waist belt on a vest or elsewhere is irritating. However, were I to be interested in expeditions or carrying a bunch of maybe, could happen stuff, then a peck of good vests exist with all manner of well-designed load-toting features. Wingworks and I also have an LLBean vest, use them both. When things turn colder, LL Bean waxed cotton field jacket.